From Plain Cold to Just Cool! In keeping with its heritage of innovation and efficiency, Chambers appliances bring you affordable on-trend style, space efficient solutions, high performance, and the latest in technology and design. 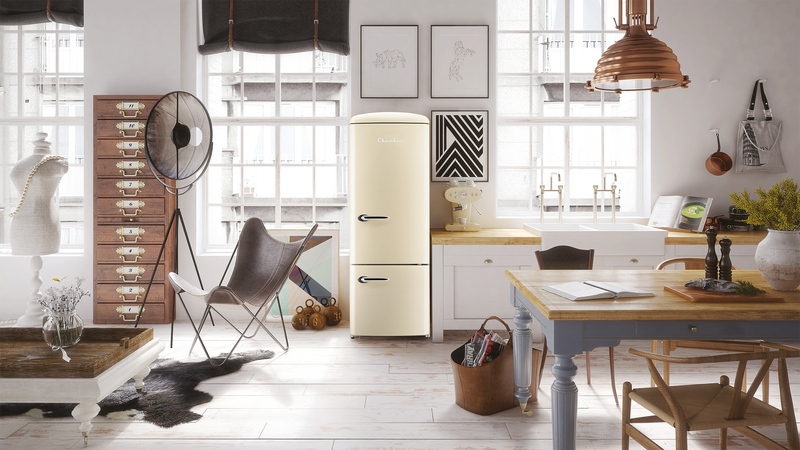 A combination of vintage design and a choice of passionate colours make the Chambers refrigerator a welcome emphasis in your kitchen interior. As a design item it can also be easily placed in the living room, which comes in especially handy in smaller urban nests, but also in modern open-space living environments. 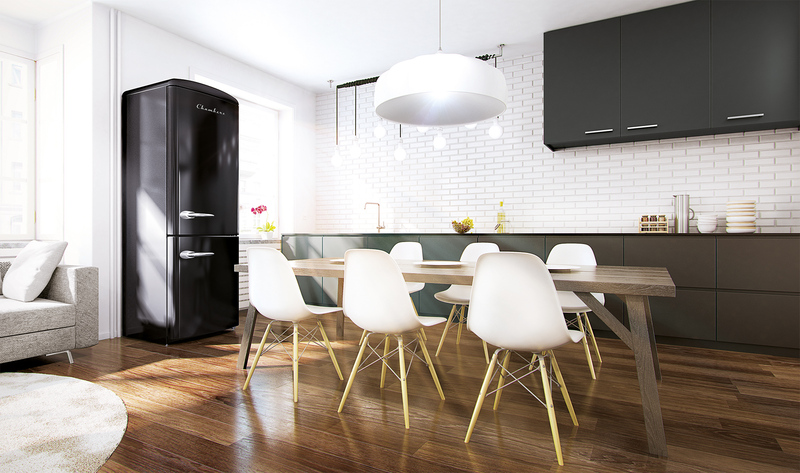 Great for the cottages and man caves each retro refrigerator boasts optimal space usage, an elegant character and all the helpful features one would expect from a true charmer. Whether it is nostalgic Champagne, sleek Inox (Silver), seductive Bordeaux, or midnight Black, these modern icons are an instant hit wherever they pop up. Stop the boredom! Smaller, more compact refrigeration doesn’t have to be an uninspiring box. The Chambers Retro Fun Fridges offer three different configurations to give you the perfect fit and features for your office, the rec room, student dorm, smaller home; basically, anywhere you could use refrigeration without having to tear out a wall or build an addition. 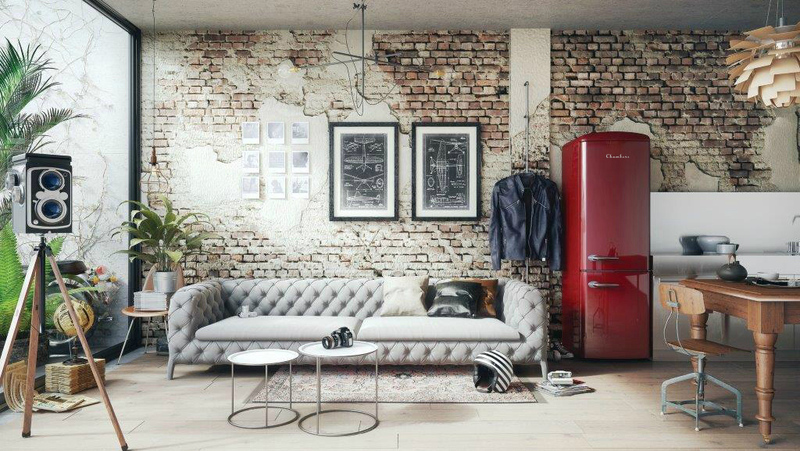 These 1950’s and 60’s retro inspired fun fridges come in a beautiful range of colors to add interest and excitement. The solid diecast chrome handle exudes style and nostalgia of the days when car doors and hood ornaments where pure jewelry. Click below to check out the undercounter all fridge, the big brother all fridge, or the funky and functional 57” tall bottom mount. Butter Cream, Wine Red, Light Blue, Empire Green are all colors that look great and spark conversation. 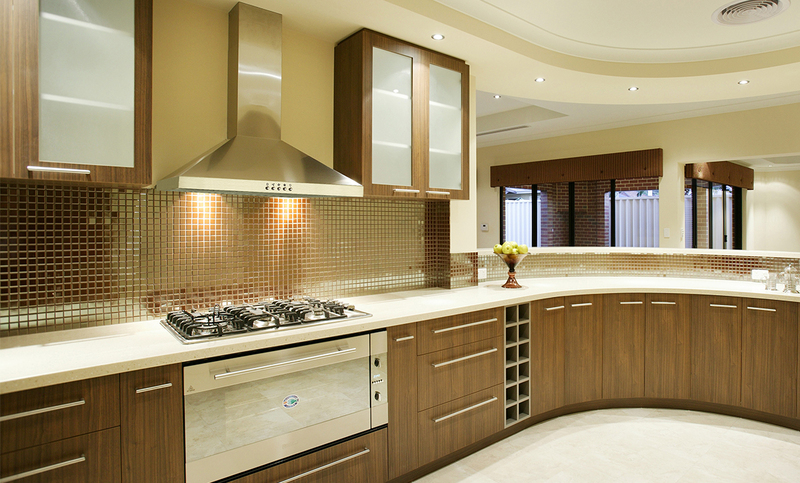 Like a diamond in a ring setting, the Chambers hood adds sparkle and elegance to the kitchen. Created using the latest manufacturing techniques and inspired to deliver the best combination of innovation and value, the Chambers hood fans are finely crafted with premium stainless steel to maintain their good looks. Chambers also goes beyond efficient ventilation and offers a range of iconic styles with features such as invisible controls, perimeter venting, LED panel lighting and integrated heat sensors to deliver outstanding performance and convenience. With no visible branding, the Chambers can pair with any cooking appliance and makes a visually stunning and functional impact in your kitchen. The performance is better than expected. I have noticed that my food is lasting longer. It's the first thing people notice when they walk in my condo. My guests and I love the colour. Quiet running and absolutely the perfect size. Everyone who sees it just loves it! The style and size of fridge fits great into our older home. I like the amount of updated features in it. Very quiet. Retro handle fits perfectly in my kitchen. The beautiful retro design and color are the selling points. Love the refrigerator! The style and color of this fridge is perfect "retro French" style. Shipping was quick and delivery efficient. I just want to say that the fridge is absolutely outstanding. Its like a conversational furniture piece for real. People have stopped talking about how incredibly small my kitchen is in my 101-year-old home and how adorbs the fridge is. I love it! !